In the years preceding Oklahoma statehood, the Ouachita Mountains remained as wild and rugged as the old west. Heavily forested, and lined with hidden caverns and ravines, this area was a favorite hiding place for outlaws and bandits. 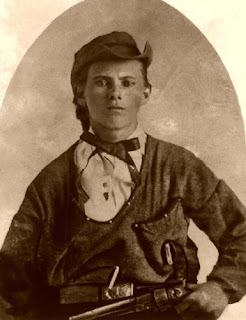 One such place, Robbers Cave, is known to have concealed the legendary Jessie James, as well as other famous outlaws including the Youngers, the Dalton Gang, the Rufus Buck Gang, and Belle Starr. The Robbers Cave area is strewn with rock outcroppings topped with massive boulders and surrounded by dense vegetation. Gentle rivers flow into Lake Carton just a short distance away. The main cavern runs more than 40 feet back into the mountain, and at one time clear springs dotted the area. The lore associated with Robbers Cave area is vast, dating to its use as an Osage hunting ground and as the object of French exploration in the eighteenth century. During the late 1800’s, Civil War deserters and outlaws reportedly hid in the cave, the location and local terrain made the cave an almost impregnable fortress, with the criminals allegedly able to escape through a secret back exit.